This year, since we just bought boats, we decided to enroll in the ACC's 'School of Recreational Paddling.' In order to feel useful (I like to feel useful) I wrote this article about it for Arkansas Outside. Rather than writing a separate blog post about Rec School, I'm just going to plagiarize my own work and cut and paste it here. 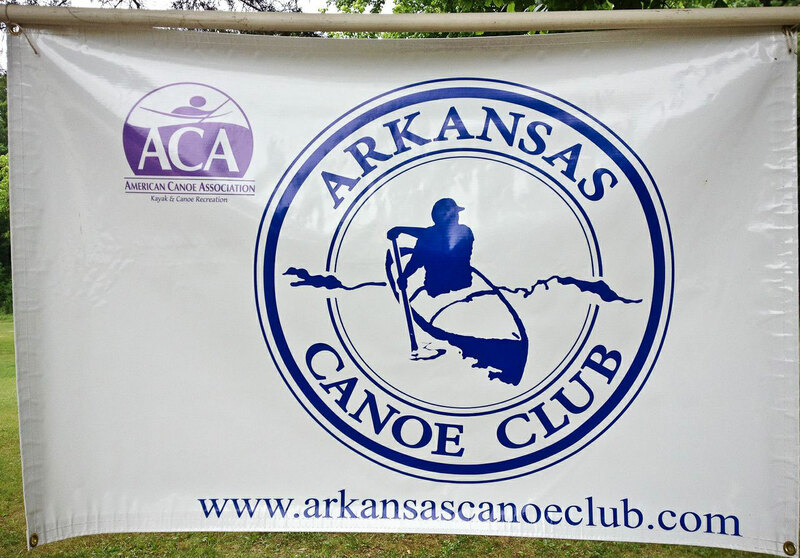 The Arkansas Canoe Club is about forty years old, and they’ve organized training weekends for thirty-seven of those years – Canoe School evolved into Whitewater School, and then about ten years ago they began offering a Recreational School as well. That experience shows in the really good programs the club puts together. Those good at organizing organize. 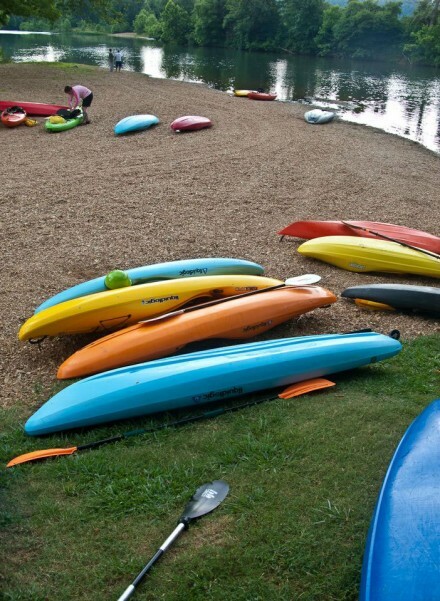 Other paddlers work to be certified instructors, and they teach the classes. 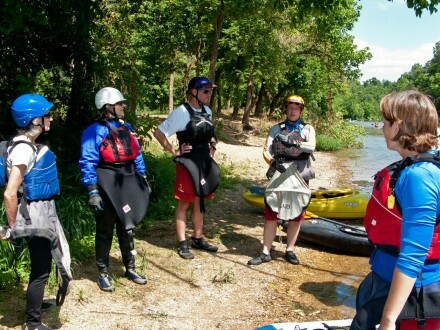 Experienced boaters who are trained and comfortable with safety hang toward the back of the groups, and are available to help students with fitting issues and one-on one instruction. These are people who love what they do, and further, they’re GOOD at it. We, on the other hand, are NOT good at paddling. 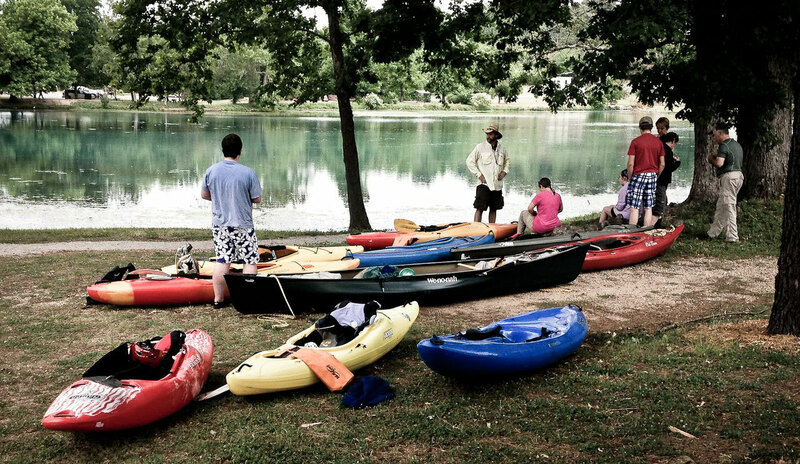 We’ve always been rent-a-canoe-once-every-summer-and-try-not-to-fall-in-too-much people. We enjoy boating but not in the kind of way that means we have any particular skill at it. 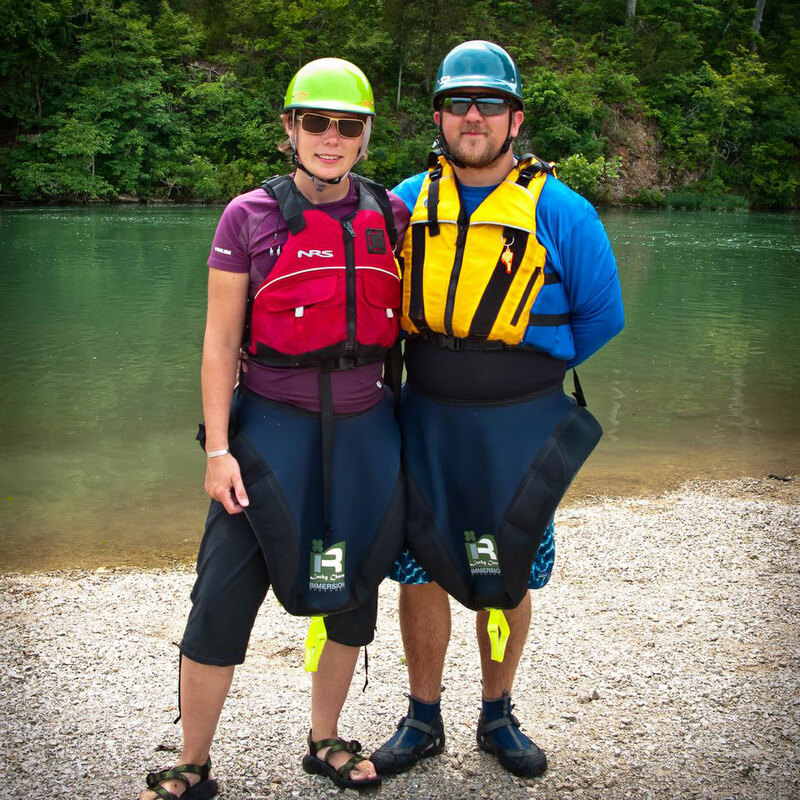 This year, though, we decided to ‘take the plunge’, buy kayaks, and learn how to paddle them. 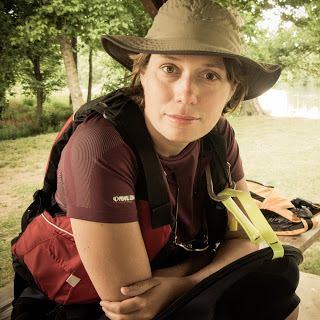 We’ve had our boats long enough to be semi-comfortable in them, and we were glad that the canoe club had room in rec school for us, because we have a lot to learn. The private riverside campground where the school is held each year is large and busy, but it’s well run, with empty trash cans and strict-ish rules and definite quiet hours. There are lots of tent spots, nice trees for shade, areas for camping trailers, and two different types of cabins for folks who prefer not to sleep on the ground. And there are a LOT of boats here – boats on trucks, boats on trailers, boats on cabin porches, boats just sort of wandering around on the grass between tents. We pulled up a few minutes late for the introductory session at 8:00 Friday evening. A big half-circle of students in lawn chairs listened attentively as the school’s director went over a welcome and some basic guidelines for the school. 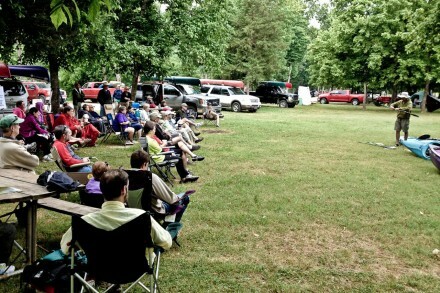 We split briefly into our separate classes, including a tandem group and a canoe class. The kayak groups seemed to be divided more according to ability than boat type or age. Most of the kayaks in the school were closed-top recreational or whitewater boats, but there were several sit-on-tops too, and even an inflatable kayak. After a quick introduction and outline of plans for the next morning, we headed off to bed. Class began again at 8:00am on Saturday. After an introduction, several of the school’s instructors gave short presentations on a wide range of topics. 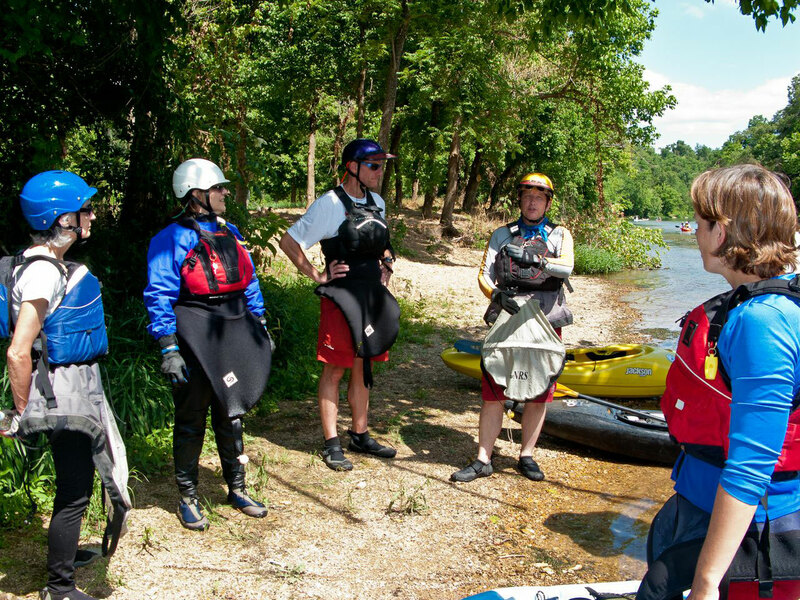 One covered different kinds of boats, another talked about types of helmets, and a third discussed what to look for in a PFD. 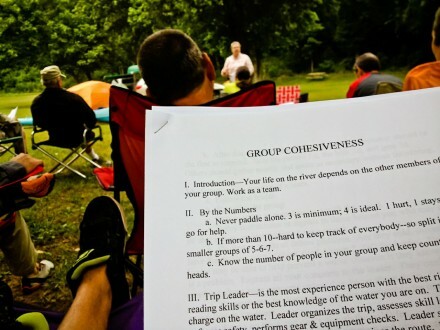 Others covered things like group dynamics and leadership, hand signals, and other safety stuff. Everyone was ready to go right after the hour-long discussion ended, so we ran shuttles and were on the water by late morning. 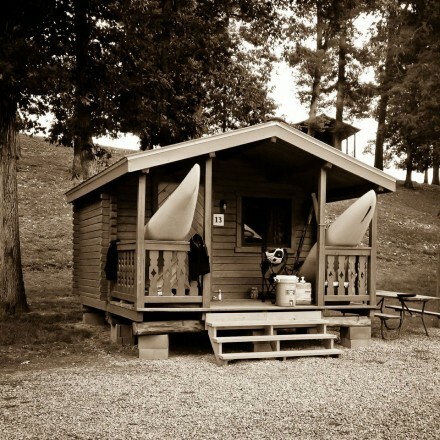 Many of the classes – including ours – began the in-the-boat part of the school in the big pool right at Mammoth Spring. 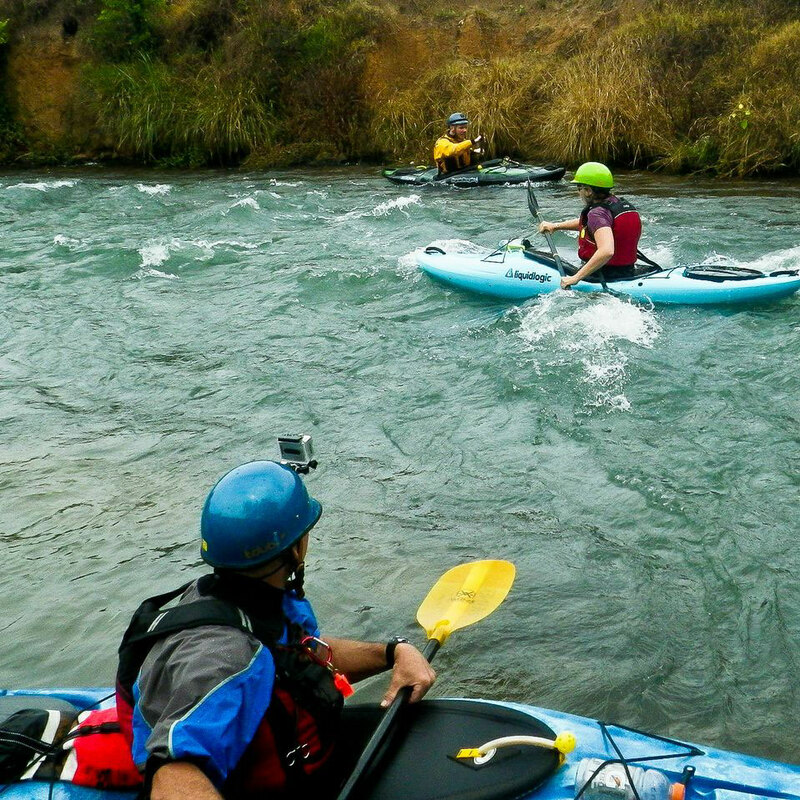 We learned the names and proper techniques for using several different paddle strokes, and got to practice boat control in the still water between the spring and the dam. 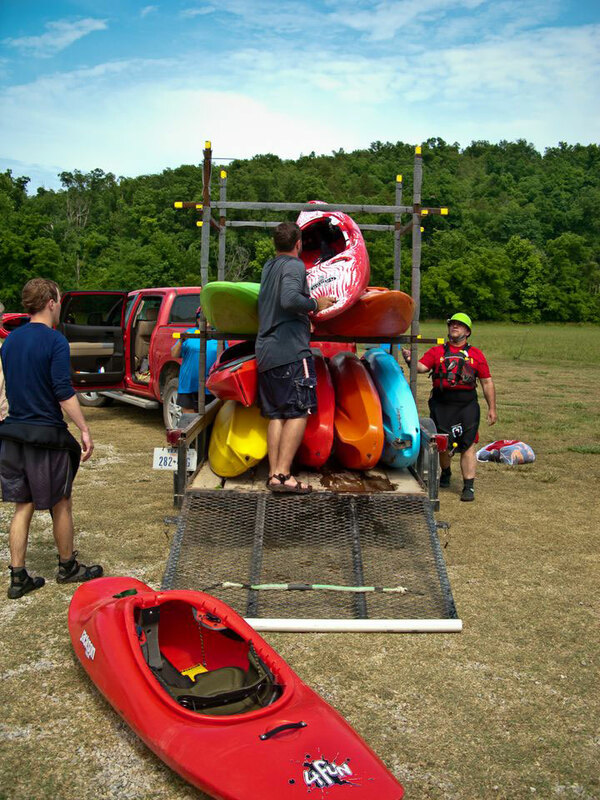 I was having trouble with fitting in my new kayak, so our safety boater, David, took time to help me. We went to shore and spent some time adjusting the seat fitting and foot pegs before getting me safely back in the water. 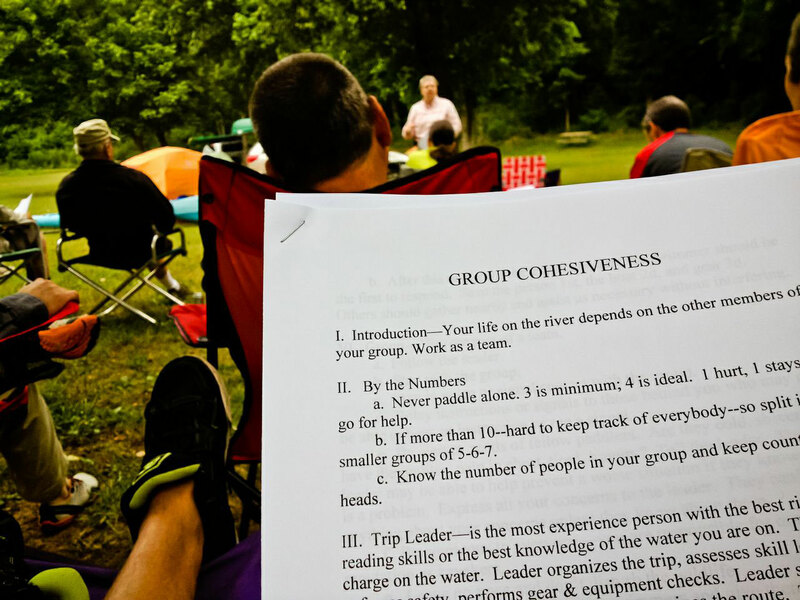 Our group ended the morning with some practice ferrying across the current at the top of the pool, and then ate lunch together at the picnic tables nearby. The afternoon part of our class was spent on the cold upper part of the Spring River, between Dam Three and our campground. 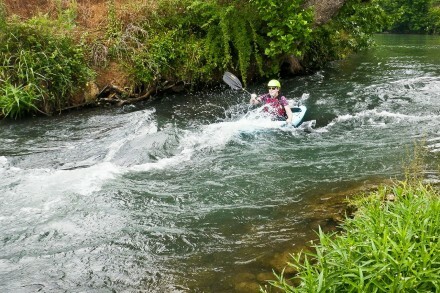 We had a chance to practice strokes and boat control in the mostly-slow river current. 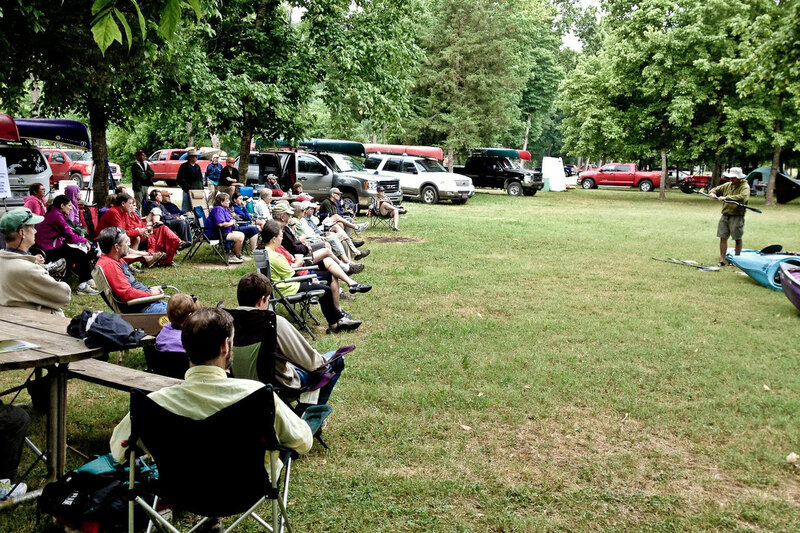 We pulled out near our tents and had time to rest in our hammocks before the whole school met up for a catered BBQ supper in the pavilion, under the big Arkansas Canoe Club banner. Sunday morning started at eight, also, with a big group shuttle to the point where all the classes would end our afternoon paddle. Just as we were about to get on the water, though, a storm rolled in. Part of the weekend had already been spent learning about safety on the water, so this was a good opportunity for another lesson. When we heard thunder, we all turned our boats over and took shelter under a nearby pavilion until the storm had passed. Sunday’s section of the river felt stronger, with swifter current and more waterfall areas, and it allowed us to continue practicing ferries and peelouts and pulling into eddies. It was nice to practice these skills on an easy river under the watchful eyes of our instructors because these are the basic river running skills that a paddler will use over and over again. One of our classmates flipped his boat while crossing a swift part of the river, which gave us an opportunity to watch a ‘rescue’ in a really safe, controlled environment. There were still long, flat sections of water, and we paddled slowly through them together, giving us a chance to listen to our instructor, Michael, describe the next challenges, and an opportunity to ask questions about problems we’d noticed. Later in the afternoon, we pulled onto a gravel bar to stretch our legs and to have a talk about the rope bags we’d noticed many people carrying. The water was cold, under cloudy skies, so Pat, our assistant instructor, got into the water to demonstrate the way to catch a rescue rope. The rest of us stayed out of the water, dry and warm. Only a couple of people in our class were ready to get out of the water when we reached the take out where our shuttle cars were waiting. I wasn’t one of them – I spent the last few minutes of the float planning a summer paddle with my classmate and new friend Anne.